Bahamian writer/actor/producer/director Cristian Young-Miller will be showcasing his movie 'Co-Incidence' at The Bahamas' very own Galleria Cinema this holiday season. Try to picture a conflicting love triangle between a dead woman and a psychic, and another woman intent on having her name etched in the pages of time - toss in a few normal people, and voila! Your are one step closer to getting just a hint of what Bahamian director/producer Cristian Young-Miller's new movie is all about. The independent film is scheduled to make its world premiere at Galleria Cinema, Mall at Marathon this Friday. With a catchy underlying theme that emits the phrase "Even when the universe brings you to your lowest point . . . it's working to create your greatest good," the movie named 'Co-Incidence' because of its parallel story lines, is by far expected to be anything but a snoozer. And despite the C rated flick being shot in Los Angeles, California, according to Mr. Young-Miller who wrote and also acts in the movie, one of his reasons for bringing the film to The Bahamas is to highlight Bahamian talent. "I like the idea of Bahamians knowing that we as Bahamians are capable of more than what we're doing right now," he says. "We have people out there making movies and doing things that may change the world and I wanted this to help inspire young Bahamians to know that we can do anything we want," he adds. A graduate of St. Augustine's College high school, Cristian spent much of his childhood in The Bahamas, but no one may have guessed that the future entertainer, who held his first camera at the age of 12, would go on to major in Psychology in college before realizing his true love for acting, directing, and producing while taking an acting class. Nevertheless, grabbing the spotlight should be the norm for the son of former Miss Bahamas beauty queen Sandra Miller. After college Cristian went on to become a freelance producer for the Disney Channel, SoapNet, Toon Disney, and has even worked as a production assistant on the popular fish-friendly 'Flipper' movie. Co-incidence is his second attempt at directing his own movie as he has previously featured a film short called 'Consequent' on the Internet. "My goal was always to go on and find a director who understood my work. My work is different, it is not the standard movie, it has ideas that are quite different," notes Cristian, explaining how he came to write, act in, produce, and then direct his own movie. Using a high definition digital camera like the one used by producer George Lucas in the filming of Star Wars II, a cast and crew of about 50 persons and a far from extravagant filming budget, it took Christian two weeks to write, a month to re-edit, and amazingly only four weeks to shoot the film. "Theoretically, the movie looks just like George Lucas' minus a 120 million dollars," jokes Young-Miller who notes one of his favourite scenes in the movie takes on a vividly yet colourful twist with a Bahamian rake and scrape song. "They can expect to have some fun, they can expect to be surprised in the end, they can expect to spend a little time in getting away and come out with a new way of looking at life," says Cristian, expressing his take on the film. Cristian also reveals that plans are on the way to write and complete another film. He says with excitement, "Oh yeah! In fact I'm writing it right now!" The show will run through the remainder of the holiday season, before returning to Los Angeles where it's expected to hit video stores on DVD. Finally putting my money where my philosophical mouth is, I have began the most difficult project of my life. I am starring in and producing a film that I have written, that will hopefully give people a new way of looking at life. The film is entitled: 'Co-Incidence.' 'Co-Incidence' is centered on a love triangle among a dead woman, a psychic man that believes that it is his destiny to prove the existence of the afterlife, and a woman who believes that she can be remembered in history by attaching herself to the psychic man. Like the majority of my projects, I am using 'Co-Incidence' as a delivery devise to communicate an idea. The idea behind 'Co-Incidence' is that: Even when the Universe is bringing you to your lowest point, it is working to create your greatest good. After deciding that it was time to do my first film and before I actually started to write the script, I had to decide what was important enough to spend a year or two and a lot of money to communicate to the world. I decided that a "destined goodness" is the most important idea that anyone could share. The one thing that everyone has in common is disappointment. Everyone has passionately desired something and has been hurt when they didn't get it. And everyone in that moment of dismay has wondered "why?". 'Co-Incidence' tries to explain why, and does it with as much humor and heart as I could come up with. I have always tried to live life without regrets. So, after the script was complete, I had to ask myself what type of actions would bring a smile to my face after I took my last breath, and had to review my life in the presence of the unfiltered love of the Universe. The answer was bringing to life projects like 'Co-Incidence' that give people a new way of looking a life, while injecting uplifting ideas into the world. And since you never know when that last breath is, it is always better to go out and create the life that you want to live, instead of waiting for someone else to create it for you. Although I thought that the movie was finished, I took a look at it recently and realized that it wasn't. I put another 192 hours of work into the visual effects and audio, and now, for the first time, I can say that the movie reflects what I was thinking when I wrote and directed it. Here is an article about the theatrical premiere of 'Co-Incidence'. Click here to read the article. Co-Incidence' premiered with few technical problems to a group consisting mostly of appreciative friends and relatives. The Bahamas is what is referred to as an action island i.e. action movies do really well there. 'Co-Incidence' is not an action movie. I did 5 radio interviews, 3 newspaper interviews and a TV news interview. I signed a few autographs and was recognized from the movie. Overall, I am satisfied with what went on down there. And what it really showed me was that there is definitely a market for this and these types of movies. I would consider the run of 'Co-Incidence' to be an artistic success. 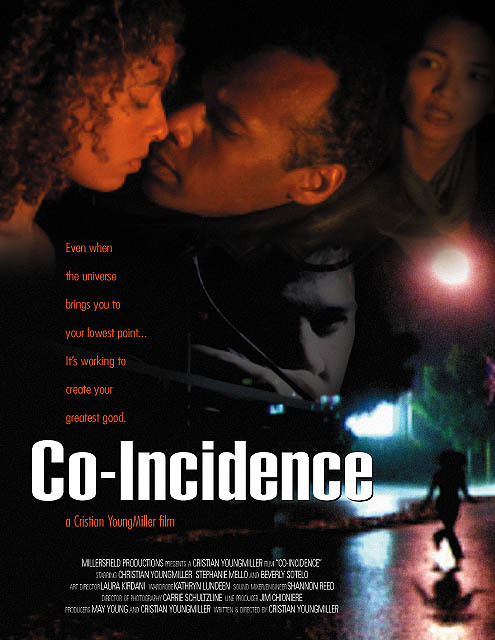 'Co-Incidence' ended its theatrical run in the Bahamas on December 27th 2002. Congratulations again to everyone involved. After a year and a half, Co-Incidence will be making its world premiere at the Galleria Cinemas in Nassau, Bahamas. It took some work to make it happen between negotiating with the theaters and with SAG, but on the 19th of December 2002 I will be hosting the theatrical world premiere and everyone is invited. I suggest that you get tickets soon because the night will be sold out. After the delivery of the final revision of music 'Co-Incidence' is officially complete. I would like to thank everyone who worked long and hard on this project because your hard work is evident. All that is left now is for me to sell it. Although I got great feedback from the studios they were unable to pick it up. There are, of course, other companies and the festival circuit. Stay tuned. Today I was able to finish the final cut of the film as well and a first audio mix. Now I send a copy of the cut to 'Fine Line', 'Lions Gate', and 'Fox Searchlight'. They are the companies that have expressed a desire to see the final cut. While those studios evaluate the movie, I will be doing color correction and creating the credits. I also welcome the final member of the 'Co-Incidence' team. Thomas DeRenzo is the composer for the movie. He will be working with live musicians to create a score that should truly bring the movie to life. It has been exactly one year since I started writing 'Co-Incidence.' Who knew it would take this long. Who knew that this is where I would end up. Who knew I could survive a whole year while making a movie without a source of income :-) 'Co-Incidence' has lived up to its potential thus far and the screenings have been met with surprisingly good feedback. I, of course wrote the movie with a message that I wanted to communicate and people seem to be getting it. What more can I ask for from the story? The success that 'Co-Incidence' has seen so far is due to a lot of hard work from a lot of people, not to mention the dead ones. Would I choose to do this year again? Definitely! I have found my future during this past year and there is no stopping now. Today I finished the first cut of 'Co-Incidence'. The next step is to hand the tape over to friends who can give me feedback and also to hand the tapes over to composers who are interested in creating music for the film. After incredible good luck and help by the powers that be, I have now had a string of bad luck. After the crash with the LA film festival, it was determined that by luck of the draw, I bought a hard drive that had a faulty part. A week or two later I again rented the expensive deck to finish the movie only to have an unusual file copy problem, mixed in with disappearing media problems caused by the software companies tech person giving me incorrect information. The third in the set of 3 was earlier this week when I had all of the tapes transferred to DVcam and couldn't figure out why I couldn't get my system to work. Apparently the company that copied it accidentally transferred the tapes to the wrong format. Since March 22, I have made absolutely no head way. It's a pretty amazing thing considering the effort that I have put into it.It is, however, hard to get upset at a set of circumstances that are complete out of my control. I have to figure that I am getting a lot of help from the guys on the other side, and I can't doubt that they want me to finish the film. But obviously they have a very specific timetable and specific experiences they want me have along the way. As long as I know that they are there and that these circumstances are completely out of my control, I could rest assured that they have everyone's best interest in mind. Now this is an interesting story. Due to a conflicting project, I decided to purchase an editing system for my home, and with the help of Airship Pictures I transferred all of my files there. My goal was to finish a rough cut in time for the LA film festival which was today.Working 12 to 16 hours a day and then going a straight 25 hours on the final day, I was able to complete the rough cut in time. But, through a series of coincidences and without warning, one of the hard drives containing the movie files became corrupted and I was not able to print the movie to tape. I have to say that I was taken back by this turn of events. From day one, the winds have all been blowing in my direction, and to have such an incredible set back is surprising. Although shaken, I have not been knocked down. Producing a movie is a matter of addressing a series of problems. This latest problem is the largest one I have faced so far, but I like to think that the solution already exists within the universal flow of energy. Coming up with a solution is a matter of relaxing and tuning in to the universe, or God then allowing the information to reveal itself. Co-Incidence is about the idea that even when the universe is bringing you to your lowest point, it is working to create your greatest good. So, instead of wallowing in what could of been, I am looking for what will become. By the way, the movie looks really good. AFM is the largest buyers and sellers market in the world for independent movies. In preparation for the market I had to pull a stretch of 40 hours without sleep in order to complete the trailer. The movie poster was completed by Sean Michael. He did an excellent job. I would consider the market to be a success due to the fact that I was able to line up a possible Video/DVD/Broadcast distributor for the American market. You can now access the Co-Incidence page directly by typing www.co-incidence.org. Although I have started editing at Airship Pictures, I will be doing the editing myself due to a conflict with Jon's schedule. I am disappointed that I will not be working with him but everything works out for the best. I welcome Jon Budd to Co-Incidence's creative team. Jon is my favorite editor from my work with the Disney Channel. He was the only director that I worked with that really got my humor and was able to make suggestions to make it better. He is also the only editor that I seriously considered working with. We will be working at Airship Pictures, a excellent post house that specializes in special effects and animated material. I am excited to get underway with the final phase of production. There is only one more creative position to fill and that is the role of Composer. Everything has now been returned and the process of post production begins. I have to give a great deal of thanks to Jim Martin at Simm Video who rented us the Camera, sound equipment, and some lights in support of independent filmmaking. Without hesitation, I encourage everyone to use them in the future. Now on a personal side I just have to figure out a way to stop the dreams that revolve around me getting more and more shots, even though they don't exist in the movie. I imagine they will end with time. I would also like to thank Shannon Reed for his wonderful sound and all of the production pictures on this website. Wow! Just like that 8 months of thought and preparation is complete. I had decided in January of 2001 that it would be the year I return to writing scripts, but I didn't even think that I would shoot one. It is almost an impossible idea, but that is exactly what happened. It is interesting to think that none of the original people I spoke to about any of the positions ended up being who I worked with. And everyone I worked with gave me more than I expected. My job is only 2/3 complete but I do feel a sense of accomplishment which I should be able to enjoy more once all of the pain stops. I imagine that it will be like child birth and soon I will be rearing to go on the next project. There were definitely problems, but nothing was a show stopper. The focus of any production is what ends up on tape, and we got some excellent stuff on tape. The movie will be good. And what is more important, it will show the message that it was created to tell. It will be a beautiful movie about love and absence of love, about the workings of the universe and sacrifice; oh, and it will be funny. I am very proud! The first half of shooting is complete and everything has gone wonderfully. We have, of course had our bumps in the road. We have gone through a couple of PA's and we have had rain delays. An actress or two have expressed their frustration, and we have gone over budget, but all in all everything is going according to plan. The crew has been wonderful, and the cast has been excellent. Production will start back up on Jan. 2nd and continue until Jan 17th. I am very proud of everything that has occurred so far. The first day went outstandingly. We pulled a longer day than expected but it was great stuff that we got. The momentum is pulling us in the correct direction. Thanks to Jim and Josiah, we are ready. We have almost all of the locations and things are rolling very smoothly. Thanks to the incredible team we have, the sky is the limit on this project. The actors are exactly where I need them to be, and I am surprisingly calm. My dead friends, who have never left me thoughout the preproduction, sent me a reminder through Annett Culp. This is what my life is supposed to be about. I am fulfilling my highest purpose and I thank everyone who has joined me on the journey. I do feel like I took this project and everyone attached to it on my back up the hill, but tomorrow we start shooting and the ball will be rolling down to its completion. It isn't over yet, but now it really is out of my control. Momentum will carry it the rest of the way. Jim and Josiah Choiniere, a father and son team have joined the team as Line Producer and First AD. They are excellent. I would recommend them in a heart beat. Shannon Reed, Brian Zarka and Mike V. has become our sound department. I am sure that it will be a pleasure working with them. Laura Kirdani is the art director and her ideas will ad wonders to what is being created. The wardrobe position is now fill. There are 2 people who will be tag teaming that job. There names are Hope Misterek and Kathryn Lundeen. I am glad to have them on board. Other than being my birthday (just send cash), I was able to cast the majority of the movie today. The grand total for submissions is 700. It feels great to know that I didn't settle on anyone. Everyone truly is good in their parts and that makes me very happy. I was able to cast: Obofa, Soman, Towny, Valerie. I still have to crew up, but we are having some difficulty deciding on a Director of Photography. Like the character of Obofa, I don't feel comfortable crewing up until that key team member is found. Today was our second day of auditions. I felt like the level of performances were higher due to the fact that these were SAG actors. I still plan on offering the part to a couple of actors who submitted in the first round of auditions but I think that I found Obofa, Valerie, and Towny. Today I put another notice in Breakdown Services. It is amazing how few black women were submitted with the first 3 notices. I did have someone that I really liked for Obofa, but she couldn't do it and the other person I was considering is now the leading candidate for Soman. I also located the locations where a good deal of the movie will take place. I will have to change the desert locations to mountainous locations in the script but it will work out well. What is even better is that the new locations are within an 1hour and 15 minute drive. This means no hotel rooms. Today Annett Culp who was to play Soman had to drop out do to Union restrictions. It is too bad, but I will use this opportunity to ad more color to the mix. Today was the big day of auditions. Out of the roughly 500 submissions I narrowed it down to about 60 people who I scheduled for an audition. I was very happy to have quite a few talented actors in the mix. I was able to find 2 or 3 actors that could play each of the parts well. In truth I have my favorites in each category, but there are always conflicts that rise up, so you need backups. I have to say that it was exciting and fulfilling to hear the words that I wrote spoken. And for them to sound funny. I remember when I auditions for a first time writer in Chicago. She hugged me after the auditions because I made her words sound good. For the first time I understand how she felt. I am really leaning towards making Co-Incidence a High Definition video project. In terms of quality, HD is only a little lower than 35mm film at 1/3 of the price. The slowing economy has encouraged post houses to drop the price even more, so HD it will be. I am very encouraged at all of the offers of help I have received and can't wait until it is complete. It should be a fun movie. The Last Breakdown submission got me a few more people but I decided to do one more to get a few more black women. I have set a date for the first set of auditions. That will be 10/20. When I did the short, I never realized it was so easy to find actors. I would probably have used that option if I knew. You live and you learn. What also inspires me is that amount of people of great experience that are willing to waive there fee for the opportunity to be part of a project like this. It both makes me feel proud as well as encouraged. Though I have received some potential Obo's (lead female character), I need a few more before I call an audition. This notice should bring me a few more people of color. Today we received 9 actor submissions and 2 Director of Photography submissions. Today a casting notice for Co-Incidence appears in the Backstage West. The notice requests submissions for Obofa (lead), Towny, Patsy, Valerie, and Extras. I have always been told to expect a lot of responses... Upon checking my mailbox I learned that I have already received a headshot. Every story involving the dead needs an angelic character. The role of Angel has be filled by Alisa Shulz who is an actress that I met through Annett Culp over a year ago. As soon as I met her I knew that I wanted to work with her. I actually wrote this character with her in mind, so I am glad that she was interested in the project and wanted to work with me. Ruthie and I met today for our first production meeting. It seems that Ruthie and I share the same beliefs and a lot of psychic experiences. Now I understand why it felt as though she was who I was supposed to work with. Ruth will put her energy into finding a Director of Photography that we could use, and I will put my energy into casting the character of Obofa. This will be a difficult character to cast. I can't set a shoot date until I find her. I know that the ideas, as well as the world of the film, is unique and that the only one that can completely communicate that idea is me. However, many films have failed because one person has tried to do too much. The comprise for me is bringing in a co-director. Ruthie Crossley is predominantly a music video producer, but she has always wanted to direct. More importantly, I feel that she is who I am supposed to work with. We have been friends for a few years and I know that she will bring a perspective to the project that I can't. I have filled the role of Soman (the dead woman) with Annett Culp. Annett is a friend of mine and German actress who will be playing a main character in a TV show called 'Chromium Blue' airing on Showtime in January. I know that she will bring a depth to the character that can't be written in. I have completed the script. It is not the absolute final draft, but it is a draft that I can start to distribute to potential investors, cast members, and crew.